Humans are a massive minority on Earth. Why don't we act like it? Most of us, including scientists, are blind to the full scope of the living world. This was illustrated by an informal survey which asked biologists and ecologists from elite universities two questions. In terms of mass, is the living world mostly composed of animals, plants or bacteria? And is there more global biomass on land or in the oceans? The majority of them answered both questions incorrectly. In an age of unparalleled access to information, this is a glaring gap in our knowledge. We are now equipped to close it. I joined colleagues from the Weizmann Institute in Israel and the California Institute of Technology to estimate the biomass of all kingdoms of life on Earth. The results were published in the journal of the American National Academy of Sciences, and were widely (and more digestibly) covered by the popular press. It required years of work, collecting and integrating information from hundreds of previous studies. We documented every step in full detail and deposited it as open-source information for anyone to examine and explore. Here are some highlights from what we found. Our results exemplify the phenomenon known as plant blindness. Even though plants constitute the majority of global biomass - 80-90% by our calculations - many people consistently underestimate them. When asked, most biologists guess that there is more bacterial or fungal biomass. In fact, these are runners-up by a long way. The entire animal kingdom is only about 0.5%. Furthermore, while stunning documentaries such as the BBC’s Blue Planet help us appreciate the enormous ecosystems of the oceans, we found that there is about 80 times more living mass on land than in all the oceans combined. Finally, our results now put us in a position to reveal the global ecological role played by humanity. In terms of mass, we are a tiny minority. Humans account for only about 0.01% of the planet's biomass. This is a fraction that would in other contexts be discounted as a rounding error. But the role of this minority cannot be ignored; our impact is immense. Since the appearance of humanity several thousand years ago, the living mass of the world has been halved, largely as a consequence of deforestation to make space for agriculture and pastureland. 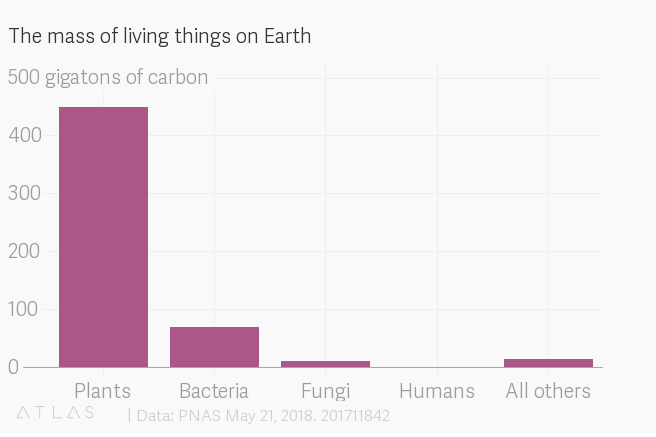 These numbers give us a new appreciation of not only how humanity has historically depleted living biomass in the past, but of how we have recently transformed that which remains. During the last few centuries, the overall biomass of wild mammals has declined several-fold. Today, the mass of domesticated mammals is twenty-fold higher than that of all wild mammals. The jigsaw puzzle that I put together with my daughter shows a giraffe next to an elephant and a rhino, an exotic image of the wild biomass on earth. If I were to reluctantly revisit this image in light of current biomass abundances, there should be a cow next to a cow next to another cow and then a pig, a rather less exciting picture. The exact proportions vary by region. For instance, Southeast Asia has more pigs, while South America has more cows. But with the exception of Antarctica, domesticated mammals vastly outweigh wild mammals on every continent - even Africa with its half a million elephants. The biomass of birds has also been vastly reshaped. The mass of domesticated birds, mostly chickens, is now twice that of all wild birds combined. The massive transformation enacted by humanity is also why our geological era, which is akin to the operating system on which the living world depends, recently had its name updated to the "anthropocene" - the age of humanity. So what is the path forward? The necessary solutions for ensuring that our children enjoy healthy and abundant natural habitats are not simple. Many require changing what we eat and how we produce it, since agricultural land use is the dominant driver of deforestation and the diminishing populations in the animal kingdom. But one thing is certain. For humanity to head in the right direction, we must take a closer look at what is around us. We cannot count on the blind leading the blind. We must pay attention and follow the light provided by the careful study of numbers.